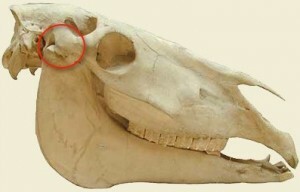 The temporomandibular joints (TMJs) are the joints which connect the lower (mandible) and upper (maxilla) jaw of the horse and are a pair – one on either side of the horse’s head roughly half way between the eye and the ear. As a herbivore and an animal which mostly eats fibre and breaks it down in its mouth the joints provide a three-dimensional range of movement to allow the cheek teeth to grind ingested fibre down into a suitable size for hindgut digestion. The joint is subjected to large forces from the grinding action of the teeth and the resistance of the food-matter. Ample provision of saliva lubricates grinding and makes the job of the TMJs easier but they are still a high-wear joint. The joint has a further role to play depending on the position of the horse’s head whilst in work – when the horse lowers its head (eg. stretching exercises, free walk on a long rein) it allows the bottom jaw to slide slightly down and forwards; when the horse is working in a more collected outline the lower jaw slides up and back a little. Depending on the state of the horse’s teeth there should be considerable lateral movement afforded by the TMJs – you can test this by standing in front of the horse, holding its chin/bottom jaw and, without the mouth opening, sliding it from side to side. Ideally there should be an equal amount of slide possible in both directions. If any of the four sets of molars have very long or sharp edges this will prevent the TMJ from allowing full lateral movement of the jaw during chewing. So you can see that the TMJs are capable of moving the lower jaw in every direction and are vital for eating and important for riding. Obviously they come under a lot of pressure during both activities which can lead to problems. If there is a problem with the TMJs and therefore muscle tension in the area this can also affect the muscles at the poll and subsequently have effects running down the neck to the back and cause uneven loading of the limbs resulting in damage to the hocks and hind suspensory ligaments. Unsteady head carriage due to poor tack/bit choice, badly fitting saddle, poor standard of riding, low-level lameness. Until recently diagnosis of TMJ pain was pretty much guess-work and a lot of people didn’t really see it as a relevant cause of performance problems. It is pretty hard to demonstrate problems on x-ray so the advent of CT, MRI and bone-scanning has hugely increased the numbers of diagnosed cases. It is always worth keeping TMJ pain in mind when dealing with hindlimb gait disorders and non-specific performance problems. It is possible to block the TMJs using local anaesthetic injections. If the horse is improved when being ridden post-injection then it would be sensible to image the area using CT or MRI where possible. If TMJ pain is suspected or diagnosed it is wise to perform a thorough dental examination and correct any abnormalities of the molar arcades. 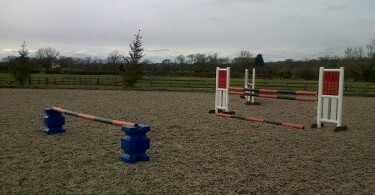 A full assessment of tack choice, fit and riding ability should also be carried out. 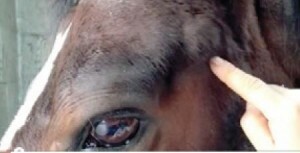 The joints respond well to intra-articular medication with steroids and many horses only require these injections to be performed once before going on to make a full recovery. Some horses need regular injections and focussed shock wave therapy and osteopathy are also often beneficial. In summary disorders of one or both TMJs and associated pain may cause problems with bitting and contact, crookedness of the head and neck and secondary (especially hindlimb) gait abnormalities. It is a disease that, due to scientific advancement, is being more commonly diagnosed however the prognosis in most cases is fairly good. I’ve treated several horses very successfully using craniosacral therapy. A non-invasive yet powerful treatment. I have also treated horses with great success and you can see the huge relief when that the TMJ is released (with most horses) using Craniosacral Therapy. 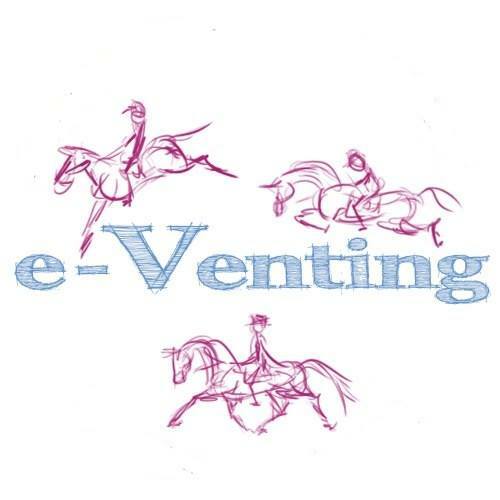 It has huge benefits for horses and people too and helps to relieve all sorts of issues, like head shaking, aggressive behaviour, uneven gait, stiffness to name but a few. It is a great maintenance therapy too.